dWRENCHED: Hello D. Please introduce yourself for our readers. dW: Tell me a little about your background. DL: I was born in New Hampshire and started drawing from a very young age, but I never had much of an art education and wasn’t exposed to different types of art in high school or college. I got a B.A. in Graphic Design so I could have a creative career and only focused on print, Web and video production until I started painting about six years ago when I moved to Southern California. dW: I know that you are into skulls, many of your art collections being somewhat morbid (lol). Yet very cool. Let's talk a little about that.Is that like ''your thing,'' painting skeletons, or it's something you like best? DL: I’ve always drawn skulls and skeletons and zombies, but never thought I could get paid for doing it. I suppose I could paint landscapes and traditional, gallery-safe art and satisfy a rich collector base, but what’s the fun in that? It’s not easy to draw a skull or skeleton in a way that hasn’t been done a million times, so I’ve worked really hard to create something new. My paintings blend Mexican folk art, 1950’s cartoon-cell animation, traditional tattoo imagery, and Southern California Lowbrow. It’s stylized and funny and very much my own. DL: I moved to Southern California in 2004 and was really inspired by the culture—the music, street art, tattoos, people, and lowriders. It’s like a switch was flipped in my brain and I just started drawing every day. Then I saw a pinstriping demo at a custom car show in Anaheim and starting experimenting with enamels and that was the game changer. dW: Is art your primary business that you do for a living? DL: I paint full-time and also do custom graphics work on the side, like t-shirt, tattoo, and logo designs. dW: What is your media of choice? Tools and supplies you use when you lay your magic? DL: My technique and tools have evolved since I started painting six years ago and right now I layer acrylics or acrylic ink, then gouache, and then 1 Shot enamel on canvas, clayboard, aquaboard, or wood depending on the subject matter, size, and style I’m going for. I use Windsor & Newton synthetic fiber brushes for the acrylic ink and gouache and I use Loew-Cornell script liners for the 1 Shot enamel. I use the acrylics for the backgrounds because they are malleable and forgiving and I can push them around and get the layering and depth I want. I can be as basic or bold as I want and add subtle elements that sort of frame the piece or help tell the story without overwhelming the imagery in the forefront. Then I use gouache for the underpainting, which is similar to watercolor but more opaque and chalky, and much lighter than acrylics. I block in character shapes and set the highlights, and since it’s water-based, I can reactivate it after it’s dried to thin out areas that feel too heavy or add more paint to imply a stronger reflection. I use 1 Shot enamel for the final layer and definition; it’s smelly and difficult to work with, but it gives me the control I need for the fine detailing. I don’t reduce it as much as a pinstriper would because I want to see brush strokes and texture in my art. That usually blows pinstripers’ minds…they stop to talk to me at shows and give me hell for painting straight out of the can. When the piece is done, I use a paint-on clear coat to lock in the gouache and unify the different layers of mediums, and then I typically build, age, and stain custom wood frames for my larger pieces. The wood building really only came about in 2011 because I couldn’t find frames to suit my artwork or keep up with my demand. I realized pretty quickly that someone else’s designs weren’t going to do my art justice, and since I already have the skill, space, and tools (because I carve tikis), it was natural for me to start making my own frames. dW: Are you more into cars, hot rods, classics or motorcycles? Do you like to ride fast or cruise? What sits in your garage? DL: Since I live between San Diego and L.A., I go to dozens of car and motorcycle shows a year, plus a lot of the Lowbrow galleries that hang my art typically have customs on site for opening night, which is really cool. I like everything from hoopties to rat rods to British bikes…flat black, flammed, pinstriped, whatever. If it’s bold or unique, it will turn my head. Just don’t show up with something I’ve seen a hundred times. On the ownership side, I have a black and white Triumph Scrambler with a Bonnie tank and ped slicer and some custom small features, so it has an old school police bike look to it. I also have a black 1969 Norton Commando that I’ve customized with a racing plate and tail fairing badge, so you could safely say that I’m into café racers. dW: Other artists you look up for, support, or enjoy? DL: I’m inspired by a variety of traditional artists like Sir Francis Bacon and José Guadalupe Posada, pinstripers like Pete “Hot Dog” Finlan and Jeral Tidwell and craftsmen like Tay Herrera and Duane Ballard. We‘ve bought pieces for our house from Jason Limon, Chris Ryniak, Johnny Crap, Dan Harding, and James McLeod, and I want some art from Candy Weil, Rob Schwager, and Munk One. I like a lot of artists who walk the line between fine art and Lowbrow, but I support artists who push themselves and hussle seven days a week. dW: Any advice or tips for the young guns in the field? DL: Look beyond your immediate circle or industry for design inspiration. If you’re doing the same stuff everyone around you is doing, you’ll never evolve or create anything you can truly call your own. Earning money is only one half of the equation; progression is the other half. I’m not splitting atoms or saving the world over here; I’m having a hell of a lot of fun painting head hunters, skeleton warriors, and drunk mariachi. I’m just saying that if your goal is to make a living from your art or skill, have pride in what you do and put in the time and effort to make it unique. dW: What's your favorite piece from your portfolio? DL: It’s tough to say because it changes almost every time I paint something new. Right now, my favorite is The Harvester surfboard painting (the one below) , not only because of the size, shape, and subject matter, but the worn background, monochromatic pallet, and design subtleties show off my style really well. It’s not the piece I’m best known for, but you know it’s mine. DL: Is this one of those job interviews where I can turn the question around to make myself sound awesome? Seriously though, one of things other artists say is weird about me is that I paint in public without fear of messing up or getting harassed. Over a million people per year come to my art booths at shows, many of which bump into me, grab my arm while I’m painting, pat me on the back, ask me questions, shake my canvas, or tell me I’m going to hell for painting prominent religious figures as skeletons. I can carry on full conversations and handle just about anything that comes my way while painting, even little kids crawling onto my lap. The only time I get really pissed is when someone tries to touch my art when I have a “wet paint” sign on it, but other than that, I thrive on the chaos. DL: I just want to keep on doing what I’m doing. Living the kind of life I want to live by painting the weird stuff in my head is as good as it gets. My Web site is the best place to see all of my work (www.davidlozeau.com); there, I sell original paintings, prints, t-shirts, and sculptures, and I blog my most recent studio activity and provide upcoming event information. 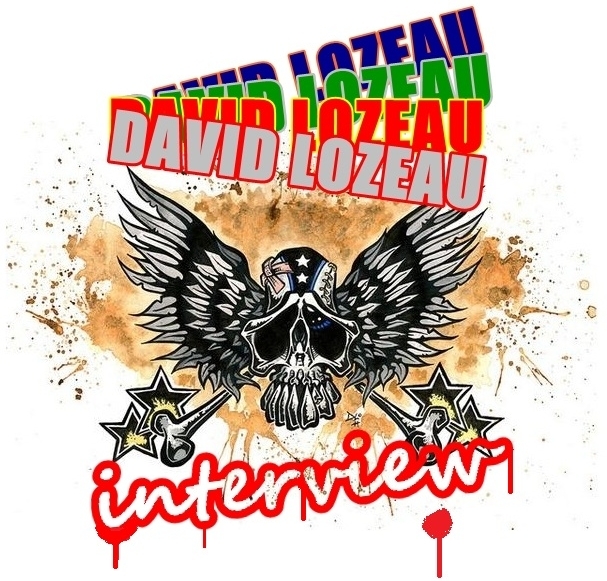 I’m a prolific artist and very active online, so I post process pictures on my Twitter (www.Twitter.com/DavidLozeau) and Facebook (www.Facebook.com/DavidLozeau) pages so that people can see the different stages of my work, ask questions, and receive real-time show updates. Future note : It's been a total pleasure to work on this interview with David. All my respect goes out to you David and you can bet I'll keep my eyes on your work. Hope you'll do the same! :)) Hope you lads had fun reading this! Great read from a super cool dude. Makes me want a Lozeau air cleaner or gas tank. Also, nice tie-ins to the 2, 3 and 4 wheel Kustom Culture. yahoooo! lol glad you enjoyed it Rono! Very very very cool Mister B. Must admit, you make some of the best articles in the custom culture !!!! keep them coming bro !!! ...Vali Neicu :))) not so anonymous, ha??!! !